For this installation the OVA package and the virtual CD image are required. 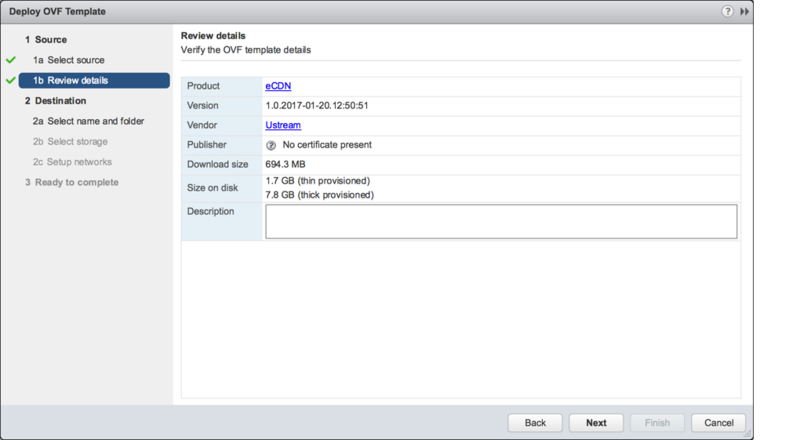 When deploying your ECDN server, you need to have the virtual CD image in the datastore. This is where you will load it from, before powering on the machine. 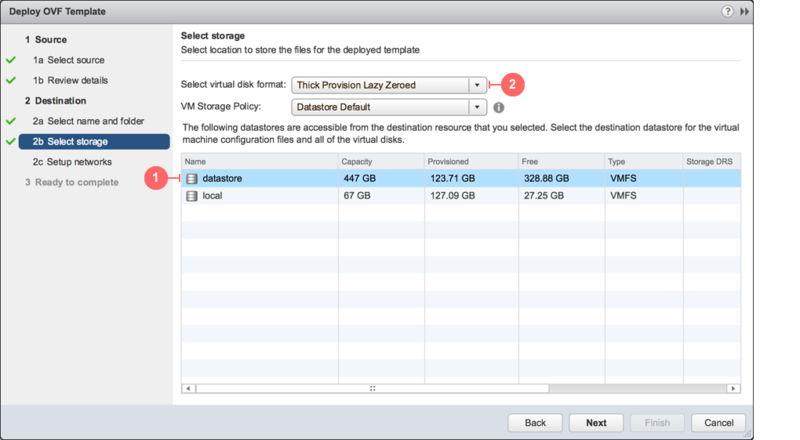 After opening the VSphere web client and connecting to your host environment, select Storage (on Home tab or in the Navigator). Under Storage, right click on the datastore of your host to open the contextual menu, and select Browse Files to locate and upload the .iso file. Wait until the image file is uploaded to the datastore. 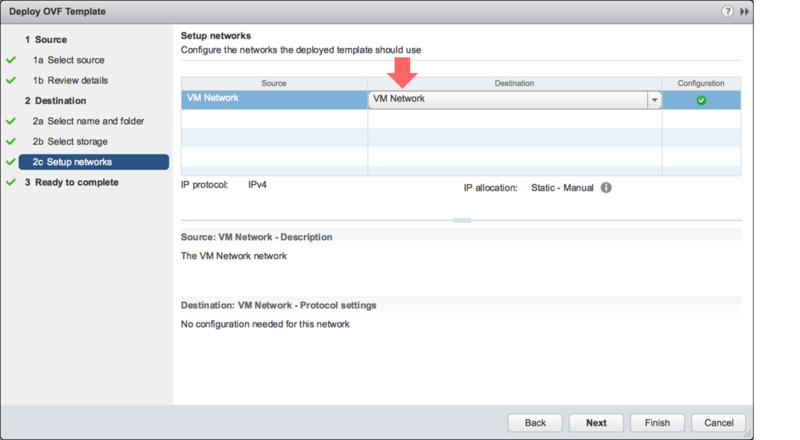 Then you can proceed with deploying your virtual machine. Select Host and Clusters (on Home tab or in the Navigator). 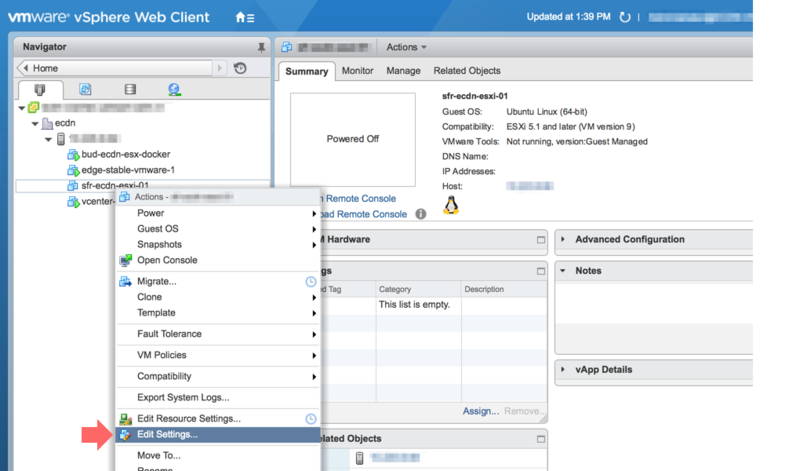 Under Hosts and Clusters, right click on your ESXi host to open the contextual menu, and select Deploy OVF Template. Select source file location of ECDN server OVA. For example, we are using a local file source. Click Next when finished. Review import details. You can give a description to the machine if needed. Click Next to proceed. Name the virtual machine and choose datacenter to deploy to. Click Next to proceed. Note: The name of a virtual machine must be unique in a datacenter. 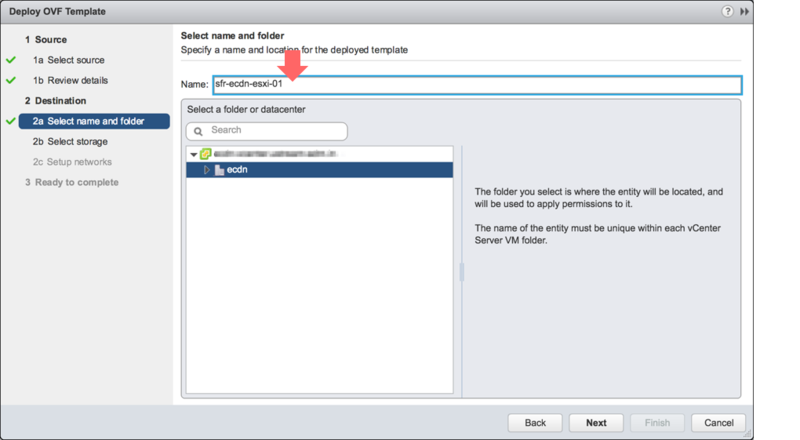 Select the storage to store the files for the deployed template. Select “Thick Provision...” for virtual disk format, this is mandatory for performance. Choose which network the instance should be added to and click Next. Note: Later further interfaces can be added. Make sure Power on after deployment is not selected, and click Finish. Select Edit Settings from the context menu of the imported virtual machine. Load the virtual CD image that you have uploaded to the datastore. Set “Datastore ISO file” for CD/DVD drive 1 (1) and select the .iso image on your datastore. Make sure that the Connect At Power On (2) is selected, then click OK. Select Power > Power On from the context menu of the imported virtual machine. 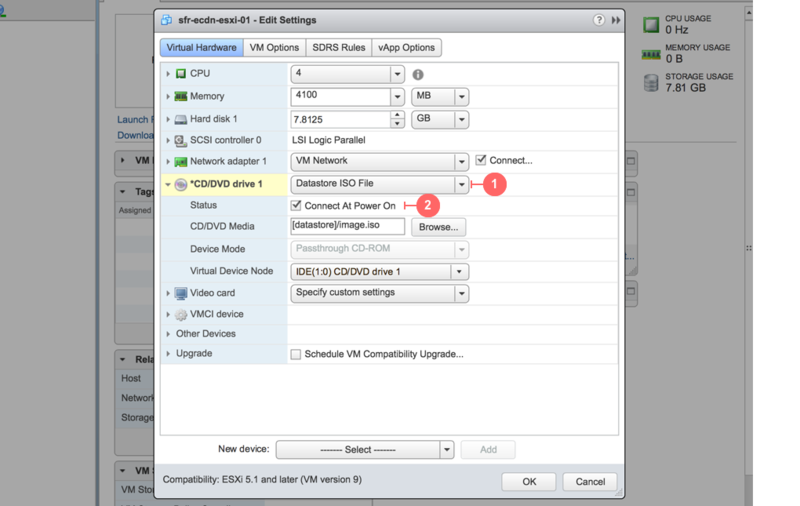 Launch the Console of the virtual machine. When requested, use default user and the default password to log in. Change the password by following the required steps appearing on the screen. Please note, that the machine is completely functional even without the password change, however, for security reasons it is highly recommended to change the password. Congratulations. You have successfully installed and launched the virtual machine on VMware vCenter.